Bank notes of different currencies, including Euro, U.S. Dollar, Turkish Lira or Brazilian Reais, are photographed in Frankfurt, Germany, in this illustration picture taken May 7, 2017. LONDON - Global debt may be under-reported by around $13 trillion because traditional accounting practices exclude foreign exchange derivatives used to hedge international trade and foreign currency bonds, the BIS said on Sunday. Bank for International Settlements researchers said it was hard to assess the risk this “missing” debt poses, but that the main worry was a liquidity crunch like the one that seized FX swap and forwards markets during the financial crisis. The $13 trillion unaccounted-for exposure exceeds the on-balance-sheet debt of $10.7 trillion that data shows was owed by firms and governments outside the United States at end-March. The fact these FX derivatives do not appear on financial and non-financial institutions’ balance sheets under current accounting rules means little is known about where the debt lies. “The debt remains obscured from view,” Claudio Borio, head of the BIS’s monetary and economic department, and two colleagues, Robert McCauley and Patrick McGuire, said in its latest quarterly report. “Accounting conventions leave it mostly off-balance sheet, as a derivative, even though it is in effect a secured loan with principal to be repaid in full at maturity,” BIS said. When buying a foreign asset, a domestic investor has three choices: buy a currency forward, undertake an FX swap or do a repurchase transaction. But while the first two are recorded on balance sheets on a net basis without taking the notional amount into consideration, a repo transaction is recorded on a gross basis, when all these three types of trades are essentially similar - secured debt. All these trades are used to remove the foreign exchange risk in a purchase of foreign securities. In a swap, two parties exchange currencies and agree to reverse the swap later. In a forward contract the parties agree to exchange currencies at a fixed date and price in the future. Swaps and forwards amounted to more than $3 trillion a day last year, equivalent to more than 60 percent of total FX turnover, the BIS said. More than 90 percent of the market was in dollars and FX swaps accounted for 75 percent of the total. They are also overwhelmingly short-term. Three-quarters of positions had a maturity of less than a year at the end of 2016. Though the outstanding amount of FX swaps and forward contracts has quadrupled since the early 2000s to $58 trillion - almost three times the $21 trillion value of world trade - it dropped after the financial crisis, reflecting a drop in hedging needs as both trade and investments collapsed. 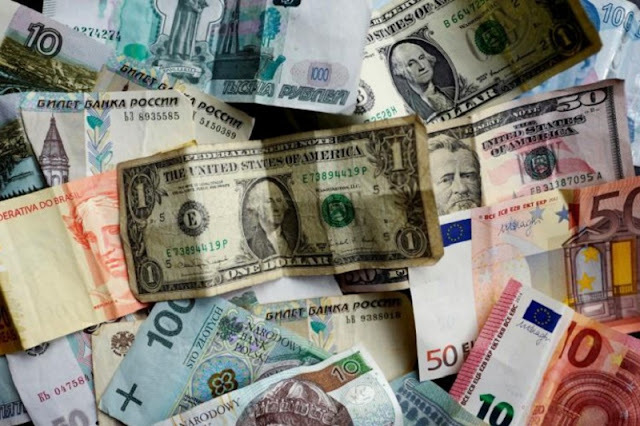 The BIS said non-financial users employ FX forwards and currency swaps for speculation and to hedge international trade and foreign currency bonds. Institutional investors, asset managers and hedge funds used forwards to hedge their holdings and take positions while financial firms used swaps to hedge international bonds. While this debt is mostly secured as counterparties usually enter into forward transactions to reduce currency exposure, the make-up of these largely short-term transactions means they are often the most vulnerable to strains in the financial system. For example, European banks increased their reliance on these money market instruments during the global financial crisis to secure their dollar funding while the collapse of the structured products markets during the crisis sent shockwaves rippling through the system. “Markets calmed only after coordinated central bank swap lines to supply dollars to non-U.S. banks became unlimited in October 2008,” the BIS report said. As for who is lending the dollars to non-U.S. banks, the BIS said the funding came from U.S. banks, central banks European agencies, supranational organizations and private non-banks. “All of these appear to provide some funding, with U.S. banks and central banks together closing about half the gap,” it said.